Advancing to the Class AA Southern League is a huge test for many of the Cubs’ top prospects. It is a place where the prospects are a little bit more polished than the levels before. In the past 10 years, there has been a trend in the majors of players skipping Triple-A after success at the Double-A level. For many Cubs’ top prospects in the Theo Epstein era, Double-A has tended to be a make or break place. Most of the players that do extremely well at Tennessee tend to make it to Chicago fairly quickly. Bryant, Almora, Schwarber, Contreras, and Russell all did well there and spent little time at Triple-A. In 2018, there will be several Cubs prospects at Double-A Tennessee who have so far risen quickly through the system. Some were just drafted out of college in 2016 and only took two summers to get there, while others have steadily plodded along, and then there are those who hope the second time around in Tennessee is better. Not every prospect makes it this far. I’ve seen all-stars in the Midwest League get cut after a disastrous season one step up at Myrtle Beach. There have been Cubs prospects who became household names that never mastered this level. Most recently, Duane Underwood spent two summers at Tennessee and will hopefully be at Iowa next year. From a hitter’s standpoint, the curves spin tighter, the slider cuts more, the fastball moves more. As hitters tend to be more patient, it is hard for pitchers to get a hitter to chase at pitches out of the zone, and the hitter will take a walk. It is rare for a player to break out at Double-A but it has happened. In 2015, Willson Contreras and his bat burst onto the scene here in 2015 when he hit .333 with a .413 OBP. It is tough to put together a great full season as the competition is so stiff. Outfielder Charcer Burks hit .313 with a .406 OBP in the first half last year before fading in the second half. Trevor Clifton had a 2.84 ERA in the first half last year before a poor second half. Zach Hedges has done very well at AA but struggled in a brief stint at AAA last year over his last four starts. In 2018, Tennessee’s roster will have several new faces of prospects hoping to prove that they belong. Regardless of their previous performance as a Cubs, they all hope to keep moving up. If they can do well at this level, their odds of professional success grow exponentially. Zack Short is a shortstop out of Sacred Heart University. He’s only had 689 minor league at-bats over two summers, but he has shown the ability to get on base at an extremely high clip and to hit home runs as a middle infielder—both coveted skills. He has a very strong arm but still needs to work on his defense, as he has been playing short, third, and second the past year at Myrtle Beach and South Bend. Short could be a utility player at the major-league level. I don’t think anyone expects him to make it to Chicago to compete for a starting position in the infield. I keep waiting for outfielder Eddy Martinez to get it going. Last year, in the second half at Myrtle Beach, he hit .279 with 7 HRs. That was his best-sustained stretch, and hopefully it can carry over to 2018. Defensively, he is MLB ready. Everyone is just waiting on the bat to break out. Starting pitchers Duncan Robinson, Michael Rucker, and Thomas Hatch were all drafted in 2016 and advanced quickly to this level. Robinson adapts quickly by adding and subtracting pitches, Rucker just throws strikes (67 percent strike rate), and Hatch is still trying to master the intricacies of minor league baseball after being thrown to wolves by beginning his career at High-A Myrtle Beach. 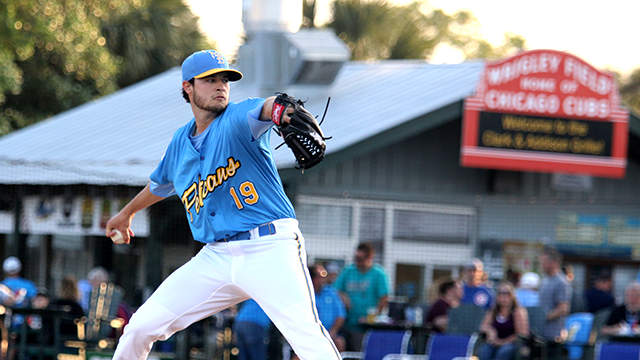 South Bend’s rotation could have bigger names, so how Robinson, Rucker, and Hatch do at Double-A should be the focal point for judging recent draft strategy of targeting pitching in the past two drafts. Their performance at AA should portend how they will do in Chicago and whether they can help this year or next. For Robinson and Rucker, they started in college, but both began 2017 as relievers at South Bend and were pressed into starting roles. That versatility can only help them going forward. Last year, one of the great stories of the summer was the meteoric rise of 6’7” relief pitcher Dakota Mekkes. He dominated two levels and did not give up a run for almost two months. He had a 0.98 ERA in 73.1 IP. His size and deceptive delivery turn a 91-92 mph fastball into a pitch that appears to the hitter to be coming into the zone at 97-98. Mekkes gets some of the ugliest and late swings you will ever see. I thought, at several points last year, that he should have been promoted to Tennessee because Myrtle Beach wasn’t challenging him. However, Mekkes stayed to work on his control, as he did walk almost 4.5 batters every nine innings. If he can get his walks down, Chicago could be calling quickly. All in all, 2018 at Double-A Tennessee will be an exciting place to watch these prospects play, adapt, and improve. If they can succeed, they would then be in a position to help the major league club. There are several other prospects who will be at Double-A that will bear watching, but the six listed above have a bit higher profile. Who knows, Jesse Hodges, Scott Effross, Tyler Alamo, or Trent Giambrone could surprise us all. It has happened before.